Learn how to make a beautiful wall hanging using wood dowels and fuzzy sticks. Gold Glitter Glue 2.98 oz. Red Glitter Glue 2.98 oz. Silver Glitter Glue 2.98 oz. Paint (2) Wood Dowels. Tip: Place a piece of wax paper under the Wood Dowels to keep them from sticking as you paint. Leave on the wax paper and let dry. Write out each of the letters to spell “love” on 4 pieces of card stock. Get creative with your letters and add different shapes behind them. We put hearts behind the L, swirly lines behind the O, stripes behind the V, and circles behind the E.
Paint your letters using the Watercolor Paint Palette and allow to dry. for added effect add some Glitter Glue to your letters! Draw (3) medium size hearts on card stock and cut out the shapes. Place a heart on a piece of wax paper. Add a liberal amount of craft glue to the heart. Use a paint brush to spread the glue around the heart, make sure to cover the entire heart with the glue. Tip: be sure to rinse out your brush as soon as you are done so that the glue doesn’t harden on the brush. Sprinkle Glitter on the heart. Make sure to cover the whole heart and shake off an excess glitter onto the wax paper. Repeat to cover all (3) hearts with glitter. Punch (2) holes in the top and bottom of all four letter cards. Make sure the holes are not too close to the edges. Tip: To line up the holes. overlap one card over the other and use the first set of holes as a guide to create the second set, as shown. Cut a Shimmer Stick into quarters. Wrap one end to the top of a card and thread on several Pony Beads. Attach the other end to the dowel. Repeat for each hole, to connect all the pieces together to the other cards and wood dowel as shown. 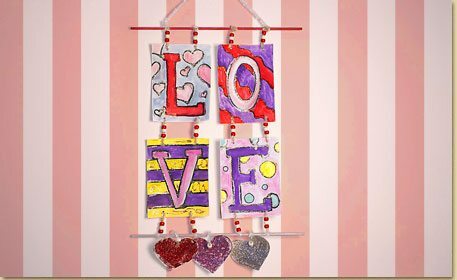 Once all your pieces are secured together, use another Shimmer Stick to create a hanger on top and display your “Love” project out for Valentine’s Day or everyday! You can adjust this project to fit numerous themes. In a classroom setting, kids can make this project using different words or pictures that relate together. You can also experiment with more than 2 cards in a column. If you’re working with a small group or even siblings, you can have each child paint a different card and hang them up together. See our “Peace and Harmony Quilt” as an example of a classroom or group project using these techniques.